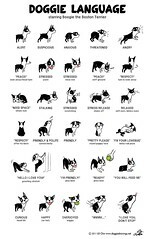 How do you stop a boston terrier with a sprained paw from doing the BT500 around your apartment, running around and jumping up and down furniture? Much to Boogie’s disappointment we haven’t been throwing the ball this past week; we want to make him rest his paw. This however, doesn’t stop him from running around anyway. The WILL TO PLAY is strong. I spoke to Jill (trainer) today to get some tips on crate-training. This is a new thing to me. The idea is to first lure him into the crate with treats. He has to willingly go in there himself, and then the next thing we do is shut the door and if he cries or protests, we are supposed to ignore him. If we respond by opening the door, he “wins” and knows that he can cry to get his way. I was nervous about the whole idea of shutting the door on him because from past experience when I once tried to put him in the bedroom, he cried and cried… Did not like that, at all. “What if he won’t go inside the crate?” I asked Jill. Is it ok to pick him up and put him in there?” She said yes. And then shut the door for five minutes, and extend the timeframe slowly each time so that eventually he will comfortably stay in his crate for up to one hour. 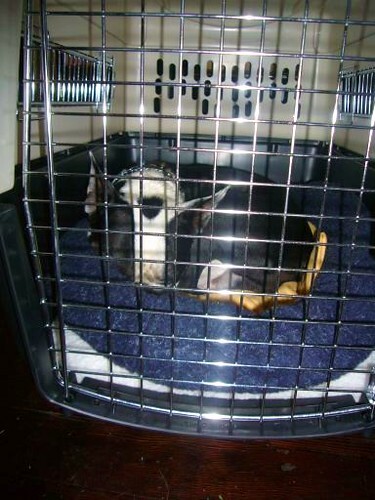 Jill: “The best way to crate-train him is to have him sleep in there at night. Then he will learn to associate the crate with BED/place of rest”. To my surprise, crating Boogie was EASIER than I expected! Perhaps because he could still see me through the bars of the crate? I gave Boogs a treat when he was inside the crate, then shut the door and gave him another treat and he went to sleep in there for about 20 minutes! I even left the apartment for 10 minutes with Boogie still in the crate, and said to Eddie – “If he cries, don’t open the door”. And the little Boogs continued sleeping, was calm and patient. No protests at all. He didn’t even react when I returned home to my desk. Then I opened the door and out he ran to grab a toy. Tomorrow – we try one hour. Another command that I taught Boogie not long ago is “Out”. (I say this when I want him to leave the kitchen when I am cooking) I no longer have to walk him out the door. I say “Boogie, OUT” and out he goes. I am very proud of our Boogie Monster and very excited about our first official 2-hour training lesson this Saturday. I can’t wait to learn more things! Entry filed under: Training, Vet visit.